Nokia Germany has announced Nokia Car mode at Internationale Automobil Ausstellung (IAA) which is a standalone application optimised for use inside a car. The application simplifies access and use of Nokia Drive which is voice guided car navigation with Nokia maps. The application is built with QT and availability for download on ovi store is later this year on Symbian Belle smartphones and Nokia N9 which is on Meego Harmattan. No word about windows phone which should be out at around the same time. 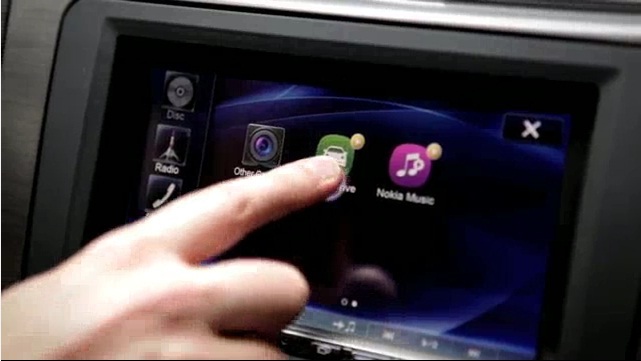 Nokia Car Mode is the first commercially available solution supporting MirrorLink, formerly known as Terminal Mode. MirrorLink is a standard smartphone-to-car connectivity platform driven by over 20 major global brands from across different industries within the Car Connectivity Consortium (CCC). With MirrorLink, smartphones can be connected to in-car displays, car controls systems, and car audio systems. Thus consumers can control their smartphones via the car dashboard, as if the device and its apps were integrated into the car itself. MirrorLink is increasingly gaining industry momentum. Among the first commercially available products presented at IAA besides Nokia Car Mode is Alpine’s new ICS-X8, a dashboard-mounted unit that lets drivers of supported cars retrofit MirrorLink capabilities and Bluetooth hands-free phone. After connecting their Nokia smartphone with the Alpine ICS-X8, consumers are able to intuitively and safely use smartphone applications from the ICS-X8’s large 7-inch high-resolution display. Below is a video of Nokia Car Mode in action.